Have you limited your worship to words? Rich communication of ideas is not limited to words, throughout time visual communication has been highly valued. Symbols are infused with meaning that is conveyed in just one glance, but which enriches upon contemplation. Colors speak to people in a vibrant celebration of life and joy. There is a sensory language which supports the Word. Colors and images call attention to the liturgical events, to seasons, to weddings, or baptisms. Events which can be celebrated may be important in the church calendar, to the larger community, to families or even to the individual. Just as voices can be raised in speech, prayer or song, the visual side of worship has just as many voices. Visual techniques can shape the environment, setting a mood for worship or contemplation; visual objects can focus the mind or communicate a concept. Each of those forms can draw people closer and unite them, or can inspire them. Curtains and drapes have long been used to control the look of a worship environment. Drapes direct and control light. But beyond the physical control of the amount of light, sheer drapes and curtains can be used to filter light and soften the effect of light on surfaces. Curtains have a majesty and richness found in color (see symbolism of colors below), texture and the flow of the fabric. Long lines of fabric draw the eye along the height of the drape adding to a sense of upward lift. Heavy fabrics tend to fold more deeply and give a sense of richness. Light fabrics give a sense of openness and flow to an environment. Texture like velvet can imply richness and majesty or cotton weave can simplicity and earthiness. Contrasting colors used on either side of curtains can add a pleasing pattern when the folds are exposed. Fringe or other embellishments add to richness or add new symbolism inherent in their colors. Patterns of cloth can add variety and a sense of action. Banners throughout the years have been used to express ideas for the congregation to share. Recently, the use of banners has had resurgence, and is expanding. Used classically to announce a liturgical season or event like Lent or Advent, a banner is just as likely today to announce community events (like Bible Camps) or personal celebrations like wedding, communion or baptism. Several decades ago the banners were typically constructed by the congregation from felt. Shapes, words, symbols all were cut out and pasted to the surface to convey ideas. The problems were that the banners tended to age poorly, the styles used shifted in popularity and so banners appeared out of date, and the materials involved could express a limited palette of the visual language—felt looks like felt. Today, the felt banners are still used to express the local congregation’s talents and moods, but the materials and construction of banners are just as often professional with a wider variety of materials using classic themes and styles that last longer. Your choices in banners start with knowing whether you are setting a mood for worship, or calling attention to an event or season, or emphasizing a message for the congregation. The banner construction can be best chosen by deciding whether this is the personal expression of the congregation or a more general theme. If you chose to personally construct a banner, then felt is still and option, banner kits are available and instructions, or a local quilting group may be able to create a beautiful individual piece that the church will treasure. If you chose a professional banner, consider the purpose of the banner, the colors chosen for the environment (see symbolism of colors), the symbolism of the images (see image symbolism) and the richness of the materials and textures used. Choose between translucent banners, and the more traditional opaque banners. Translucent banners will better blend into an environment, the effects include diffusing the view of object behind the banner, throwing up a specular “halo” effect. Choose translucent banners to have simple messages—or none, and to set moods and alter colors of the environment. 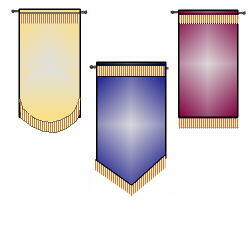 They are the subtlest choice in a banner and are best used to offer variety of color and texture to your worship setting. Translucent banners come in large sizes and can be used to define spaces or to project upon. Large banners are large swatches of color that blend in but subtly alter your environment. Choose opaque banners to convey complex messages, with strong use of symbols, words, colors. A good opaque banner is of heavy construction with a backing that lasts, with high quality fabrics, velvet, lame, etc. Want to see what Studio Productions, Inc. offers in translucent banners? Special banner materials are also an option. Paper can be used to produce wonderful effects. Three dimensional banners are easier to construct from paper than fabric, although there are vendors who also produce three dimensional banners from fabrics. Three dimensional banners can be used to create visual interest, convey thoughts. Scrims have long been used for special effects in theatrical productions. 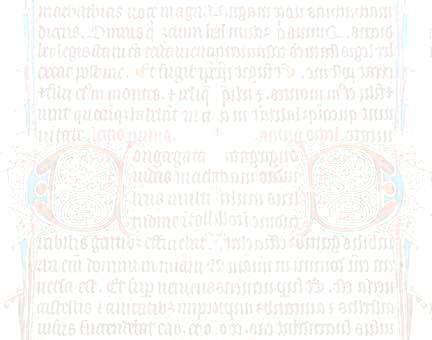 Typically, the effects used are “reveal effects”, where if the scrim is front-lit it looks like blank space. If people behind the scrim are lit, then suddenly they appear as if from no-where. There are several other possible effects: projections, shadow projections, secret entrances. Traditional scrims are sharkstooth. Sharkstooth is hard to make opaque and easy to make transparent. The other alternative is the Chameleon™ special effects scrim. Chameleon™ is easy to make opaque and can become translucent. Here’s the difference. Suppose you posed people representing angels behind a sharkstooth scrim. You light the front of the scrim with blue lights and it looks to the audience like a sky. You now remove the blue lights and bring up a spotlight on the angels. You see angels clearly now. If instead you place the same angels behind Chameleon™ , you’d see sky when you front light the scrim. When you bring up the spotlight, you’d see the angels diffused and with a “halo” glow around them. The Halo glow is characteristic of Chameleon™. Want to see what Studio Productions, Inc. offers in Chameleon™? For either effect you must have good control of lighting. Chameleon™ comes in more colors than sharkstooth, but is smaller sizes (15’ by whatever). Chameleon™ can be hung in panels, while sharkstooth must be in the larger sizes. Color, shape, flow and light. Sense of space. The use of windows in the church to introduce visual elements to worship is centuries old. The simple light flowing through high windows is imagery in itself suggesting a sense of awe, and a sense of higher purpose. The complex patterns of cut glass, refract light and direct it in spectacular ways. The colored glass of stained glass, brings color and beauty to the environment and suggests the bright colors of joyous worship. The symbols embedded in the windows suggest the important imagery of faith. The detailed pictures in some windows tell stories in an illuminated fashion. But windows are not limited to the walls and can appear in ceilings. Windows are not limited to the outside, and can exist between two parts of a worship space. Consider windows to allow walls that define spaces, but to suggest openness and inclusion at the same time. 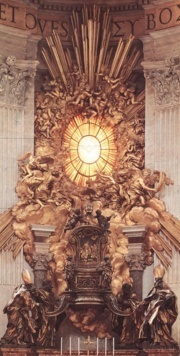 Throughout the years, art has been inspired by religious images, and religious organizations have commissioned art. The visual importance of reliefs, other sculptures and paintings is etched in both art history and in the history of churches world-wide. No-one can doubt the ability of Da Vinci’s Last Supper to convey that event in rich detail to generations. No-one can doubt that Michelango’s Sistine Chapel richly conveys the images that people have associated with Christianity for generations. But today throughout the world art works on a less grand scale collectively work the same miracle of bringing ideas to life and visually creating environments. Projections use light and shadow. The symbolism of light itself is clear. Projections can be images, words, or patterns. Gobos (originally a theatrical term meaning “go-between”) are cut metal patterns that light is projected through to produce patterns like stars, symbols, clouds, dappled shade. Simple colored lights can be used to change moods, and vary environments. Projections can be used on walls, or screens or banners or scrims. Words are not considered visual, but words themselves carefully chosen can bring images to life. It’s very true that words paint pictures, and it’s also true that words that do paint pictures are known to be moving and inspiring. Like the great artists of the world, ministers and congregations should paint with all the shades of the palette. Color, shapes, textures, images and patterns are part of a rich communication that can be used as well as voices to uplift spirits and convey thoughts. Don’t limit your worship to words. Good visuals convey in a glance ideas which can later be enriched by contemplation. < Like this article? Try What are scrim effects?